Here is the show aired a few weeks ago on EWTN. It was my appearance on the Franciscan University Presents with Dr. Scott Hahn, Michael Hernon and Dr. Regis Martin. It was a fun show about “Abraham: Father of Faith and Works” and the whole story of salvation. I know many other Arabs in Israel that feel the same way. It needs to be known to a wider audience. Click to see the full-size photo. If God Is Dead, Who Will Replace Him? Catholics Doing Street Evangelism? Yes, and Growing Fast! Join them! 2 Million Miles with Delta! Yikes! It is always fun to hear what people have to say about the pilgrimage we just completed. They’re enjoyable, interesting and worth listening to. Enjoy! Today is the last day and a lot of fun. 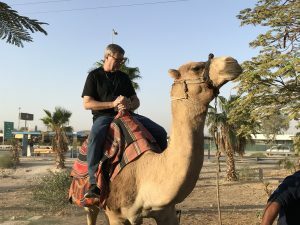 We visit the Jordan River and the Dead Sea, ride camels and have lunch in Jericho. And that’s not all — there’s a whole lot more. Enjoy this video of our final day! For the homily of the concluding Mass, click here.